First launched in 1985, reference 3940 replaced the existing perpetual calendar wristwatch, reference 3450. Featuring a circular-shaped case, the watch presented a decidedly more "modern" and less angular appearance than its predecessor. 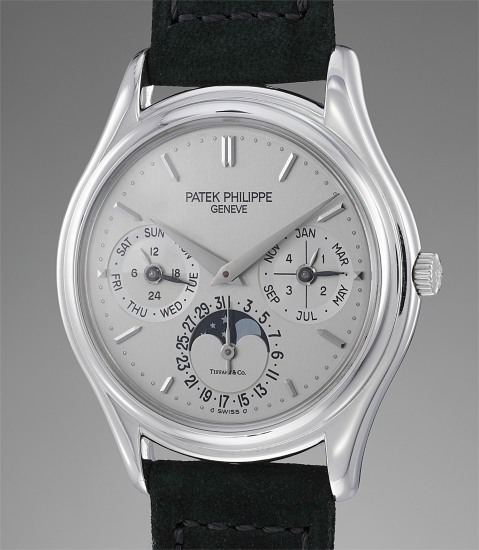 At the time of manufacture, it was among one of Patek Philippe's longest running references ever produced, ceasing production in approximately 2007. The reference was cased predominantly in yellow gold, as well as pink gold, white gold and very rarely and exclusively, in platinum. This platinum reference 3940 is distinguished by the coveted Tiffany & Co. script within the date ring at 6 o'clock. Preserved in excellent condition, it is offered with its Certificate of Origin confirming its sale at Tiffany & Co. To the best of our knowledge, the present watch is the only platinum 3940 with the Tiffany & Co. signature at 6 o'clock, underscoring its absolute rarity.